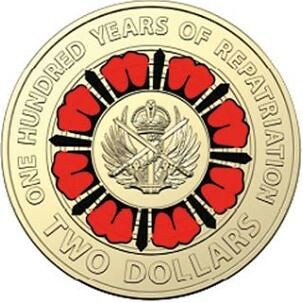 Australia will on Monday release a special $2 coin commemorating 100 years of repatriation. It will be released into general circulation and will also be available in several collectors editions. The design will then also be officially unveiled, although it can already be found below Australia Post will also release a special PNC with this coin in it. If anyone is interested in that feel free to send me a message and I will send you an image of it. Even though the poppy suggests a WW1 context: If anybody does not know about the historical background (I'm looking at a mirror here ), this page for example provides some info.